Yep, when you see the revolutionary breakthroughs we’ve made in web video publishing, I think you’ll agree it merits a full number upgrade. 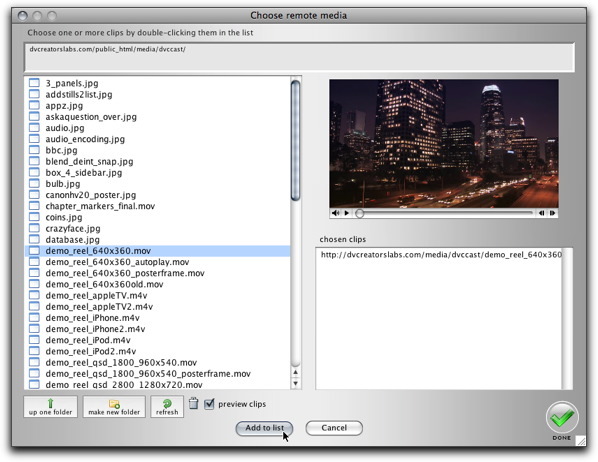 as well as publishing images and easily copying remote media file URLs. We’ve also added the revolutionary ability to choose a movie from your remote server with a remote media file browser including preview! You could spend hundreds on other encoding programs but you won’t find these immensely valuable features anywhere else. We’ve also improved a few other things, the whole list is here. The 2.0 upgrade is FREE. That’s right, FREE as in just click your “CHECK FOR UPDATES” button and DV Kitchen 2.0 is yours. People think we’re crazy to sell this enterprise-class professional media publishing powerhouse for $79.95, which is true, it should be at least $200 – $300. But we resisted raising the price for now, I think we can hold on just a little longer before it goes up, so if you haven’t purchased yet, now’s the time. Learn more about DV Kitchen here. this seems like an awesome tool. congrats to guy and anybody else aligned with this product. peace in the middle east. The only feature that I can’t see which would be awesome for my purposes would be built-in Amazon S3 uploading, alongside FTP. Have you considered this? Is it on the roadmap? Aside from that, it looks awesome and I’m setting up the free trial now!! Hi Alister, we want S3 uploading, but this is the first customer request. Get your friends together and have them ask too and we will get on it! Further features are your wishes! VERY cool tool…great features…great function…great UI…just what I need (sort of). Now the “sort of” part…for those of us still using the “wrong side of our brains”…any plans for a Windows version? Is there a DVKitchen available for PCs? There isn’t. Sorry. I know of at least one company that bought a Mac Mini to use for a DV Kitchen encoding station- even with the Mini + DV Kitchen it’s still less money than some software by itself! Josh, can you email me? I have been reading a lot on this site, which I have been visiting over the last few months. I am using Premiere Pro 1.5, but really like things I’ve seen with DV Kitchen. In your previous post to me you suggested a Mac Mini, so I visited my local Apple Store to find out more info about the Mini. I liked it, but I really out like some direction before laying out the cash for a MAC when I have always used a PC. One of the many reasons for DV Kitchen is a new client wanting a lot of web video. I think the Mac Mini with DV Kitchen would be an excellent encoding station. Done. I bought the Mini Mac a few weeks ago and then purchased DV Kitchen. Everything worked well, I did have an issue with DVK FTP and my existing FTP password. Once I spent some quality time with my hosting online chat we determined the password was the issue. It may have been the length of the existing password or DVK FTP didn’t like the required special characters? Don’t know, but have it fixed. cuestion, I have a camera Sony hvr-s270u it have a memory recording unit, and have mac wt finalcut wen import fron the memory card , iI need to render the audio all time for edit my clips is normal to do that. green chroma pulgins with transitions..
Hi there I need some help. I can use DV-Kitchen just fine, but when I use quick settings on small MP4 files(14Mb) and publish it it works just fine. When I use a large file (189Mb) it processes the file just fine BUT I cannot get it to publish, it opens the webpage but not the .mov file. Any ideas? Interesting product I may just take this for a test drive. Josh, Just wanted to let you know about a quest I have been on for the last 6 weeks or so. I am new to this web video thing and I discovered W3C Validation… Dreamweaver CS4 would not create a player that was compliant and it has been really bugging me… well I discovered that this little publishing feature of DVK creates compliant code and it is very, very easy. Thank you for your great program and I will let the world know. We should all be Mac’s anyway. 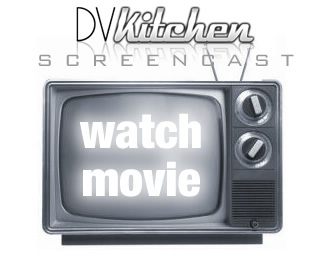 Watch the movies in the DV Kitchen Theater for more info. Has anyone else had issues getting H.264 MP4 files to play as quickly as H.264 FLV files? The FLV files seem to play right away, but the MP4 files seem to load the entire video before playing (when hosted on Amazon S3). You need to relocate the header movie atom at the beginning of the file- try opening the movie in QT player and Save As. I’ve heard about this “header movie atom” thing before. Could you please discuss in more detail and exact steps to correct it. Seems like an extremely important little detail that is virtually unknown and/or discussed.